It's all things February right now: confusing weather (snowstorm followed by rainstorm, followed by 60˚F days, followed by flooding), dreams of seed starting and growing the garden, and studio work. 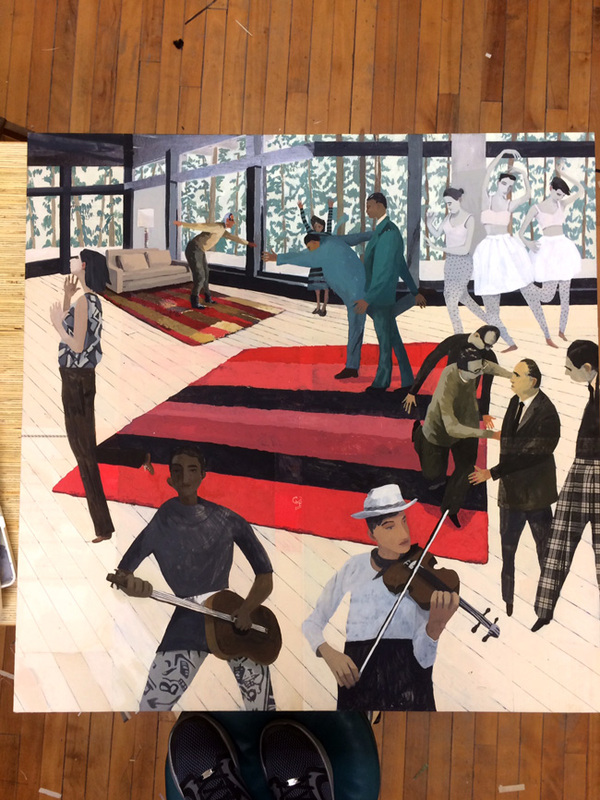 I'm working hard to finish collage paintings for my upcoming show (opens March 27) at Studio Place Arts in my home city of Barre, Vt., where I currently have a studio space as an artist-in-residence. My studio, looking out...the fishbowl! In other news, Vermont Art Guide just published their latest issue--#6--and included me as one of their "artists to watch." I'm honored to be featured alongside the likes of Janet Van Fleet and other favorite Vermont artists. I'll also have work included in one of the two exhibitions at the Vermont Arts Council later this spring, showcasing the artists featured in the artist-to-watch series. Back to the drawing board, now. May your spirits stay high--despite of or because of the rain--and may you see some good art! A work in progress in my studio - I start with a collage base of vintage images and paint over them. Two loves of mine. One drinking coffee, the other “reading” Ta-Nehisi Coates’s Black Panther. And those are my mother’s amazing rug-hooked crows in the background. Bird love runs in the #family.